The story for today...I checked nests all day and planned to end at a nest where I was told that the first chick has fledged this morning. When I arrived at about 4 pm, the gentleman who is watching that nest told me that the chick had tried to land on the top of the antenna on a cell tower and then slid down into the cell tower itself. The chick was down amongst the cables and well below the top of the tower, with many panels around her. Our first concern was whether her feet were caught in the cables or wires. After looking from every angle we determined she was free and appeared to be uninjured. But she was just perched there looking around, as if she was trapped in a cage. I watched or over two hours...chick did not seem to be making any effort to extricate herself. Dinner was served on the nest to the other chick. That did not seem to motivate this one. Finally at 6 pm I went home for some dinner and tried to figure out what to do. No cell tower employee would come out on a Saturday. I went back at 7pm and the chick had not moved. But her interest in getting back to the nest was increasing. She finally started turning around and trying to stretch her wings...but they hit on the mechanics of the cell tower. She turned around several times, looking up, looking down. She finally hopped a little closer to the edge of the tower. Stood there nervously for quite a while, trying to flap her wings in tight quarters. Then she went back to the center of the tower. Argh! Then Dad flew past with a fish. Now this chick had been stuck here for at least 4.5 hours and she was hungry...so she went back to the edge of the tower and looked down, put her wings out, retreated a bit, then finally, with me whispering "just do it", she took the leap and was out of there and flying loops which eventually led her back to her nest at 8:30. She began hollering loudly for food, and when Dad came quickly she grabbed that fish before the other chick had a chance and began inhaling it. Whew. Suddenly I was exhausted...probably from holding my breath. So there you go...that's what I go thru at fledging time! Thanks to Perry for his observations and concern over this young bird. All is well that ends well. I found several other chicks that had fledged also at other nests and one that could not be located tho I searched for quite a while. I will keep looking to confirm successful fledging. I was able to eeek out a little time to visit a few nests today. I am happy to report the first chicks have begun fledging in recent days. Now our monitoring work can be a real challenge...Locating young birds, and trying to confirm that they get back to the nest successfully. A chick disappearing from a nest cannot be considered a successful fledge! This is the time when I listen for food begging coming from the ground. A chick that flies a little too soon can wind up on the ground and adults will not usually feed them there. If left there overnight they may be predated. They are very vulnerable. I also search nearby trees, lights, power poles, looking for chicks near the nest. I am happiest when I observe them flying and they make it back to the nest safely. If you watch enough ospreys you will recognize a newly fledged chick...they work much harder at flying than the adults...flapping faster, making very awkward landings...sometimes ending with a face plant. They also can circle endlessly trying to figure out how to stop! I have concluded that flying is easy, landing is hard. Another nest visited today has lost two chicks, one nest had lost one chick and one had failed. The losses continue. I observed five extra ospreys circling, calling, chasing above one nest. I was amused to watch one little guy on his nest alone, trying to figure out how to rip and tear a fish on his own. He was barely five weeks old and did not really have strong enough feet to hold the fish as he tried to take a bite...so every time he pulled up the whole piece of fish came up. He kept toddling around the nest carrying this fish piece in his beak, like if he found the right spot on the nest, this would be easier. It was charming, but why was he alone? His Dad was in a tree, tho he eventually took off to chase a turkey vulture who got too close to the nest. I did notice a lot of flies at this nest and a chick was missing here...so there may have been a dead chick up there. The female arrived with a fish and fed the chick and then left again. I searched for the adults and could not spot them anywhere. I will recheck this nest this weekend. I am more puzzled this year than usual. I am finding a lot of chicks alone, a lot of females fishing...perhaps fishing is harder due to high water and males are being less successful. Well, it is turning into a catastrophic year for the ospreys. More chicks are dead or missing, nests are empty, the head count diminishes. I will be checking as many nests as I can in the coming days. Volunteers, please check nests and count heads more frequently if you are able. And we have not yet gotten to the usual mortalities which occur around fledging time. As I have said in the past, Ospreys are an indicator species so when their productivity decreases, we need to pay attention. We need to look at this carefully...there are always ups and downs from year to year, but this feels different. We will see what the final outcomes are...and we will compare our data to other states, other researchers. I have attended a few bandings in the past few days and most chicks are looking very good and healthy. However we have come upon two chicks at different nests that had a large number of black flies swarming and crawling on them. Vanilla was applied to one of them as this is believed to help keep the flies away, and the other had both vanilla and some essential oil bug repellant applied. It is not known if this will really help. I will try to keep my eye on these nests to see if those chicks survive to fledging. I also found another chick missing from a nest today. We may never know for sure what occurred there. It is easy to blame black flies this year, but there are many causes for mortalities. PS...july 13: another long day in the field. Sad to report that one of the chicks who had black flies on him last Thursday is now missing from the nest and presumed dead. Another nest that had just one chick is now empty. It's a challenging year for the ospreys. I am starting to see pre-fledging behaviors now on some nests. Older chicks are flapping their wings and hopping with exuberance. For some reason when I see them flapping, I count the flaps...am getting up over 30 flaps in a row as they build strength in those beautiful long wings. Chicks fledge at about 55 days...males tend to fly sooner than females and there is some difference bird to bird. Nothing hard and set about exactly when they take that leap. It sometimes seems as if a gust of wind takes away a young bird who was only intending to do some flapping...but, like it or not, is suddenly airborne. After 21 years of watching these first flights I have concluded that flying is not that hard, landing is! Sometimes they fly around in loops, as if trying to figure out how the heck to get back to the nest and stop! It often ends with a face plant on the nest. Haven't figured out the brakes. By this time the young birds are almost as large as the adults...do you how to tell them apart? I am sitting here on this PERFECT day...mid 70s, low humidity, popcorn clouds, happy to be out here checking nests. I am watching a nest that is high on a cell tower. I keep hearing a little peeping sound that sounds like an osprey who is happily eating, but I can't see him. I peek around some trees and see the male right on a power pole next to the road, eating a fish. A car stops and a woman gets out, walks right below him to get her mail, never looking up, gets back in her car and leaves. People miss so much. I laughed...but I knew he was there! The bad news is that there is one less chick than the last time I visited. Darn it. Black flies? 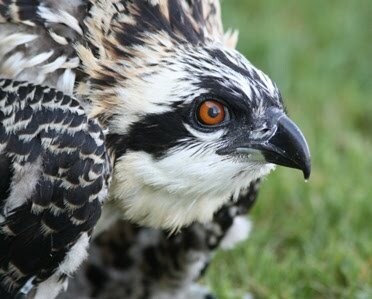 Here is a link to an article on today's paper about black flies...as he says, I believe that we have lost ospreys to black flies in the past, we just didn't see it so clearly as we did with a cam on the Arboretum nest. Check out this link...about a place in California, much like the Twin Cities Army Ammunition Plant which has been sold for development. They turned it into a park! What so many of us were hoping for...I wish Ramsey county were as forward thinking as they are in CA. With 8 osprey nests on the old Army property in Arden Hills, it would have preserved a beautiful natural habitat for the future... Turns out many CA army properties have been turned into parks. In that state it was the will of the people that the open spaces be preserved rather than developed. Guess its too late here. So sad to learn about the death of the Arboretum chick who appears to have pre-fledged as a result of being bothered by bugs. Thank you all for watching so closely. There was nothing anyone could have done. Unfortunately I did not get the emails until this morning...and I do not live close to that nest. After many days in the field, I took a day for family.